Have you ever dreamed of being a zoo keeper? 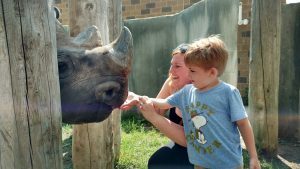 Now is your chance to work alongside a zookeeper at Potter Park Zoo and learn what it takes to care for the animals every day. If you love animals big or small, scaly or furry, then we have an encounter for you. Choose the encounter below that interests you the most and register today! Encounter times are limited; please give a minimum of 2 weeks’ notice for scheduling. Not all encounters are fully accessible. Please contact Sarah Pechtel at (517) 342-2703 or spechtel@ingham.org if accommodations are necessary. Once you have registered for your encounter you will be provided a detailed informational packet. All participants, including adult chaperones, are required to complete a signed liability waiver. Payment and completed waivers are required at time of registration. Please note – the cost of a zookeeper encounter does not include the cost of zoo admission and parking. You must be attentive. Although the animals are comfortable working with their human caregivers they are still wild animals and their behavior is unpredictable. It is important that you pay close attention to the guidance and instructions of the keeper. Never enter any animal area without direction from the keeper. Always wait for instructions and authorization from the keeper before approaching any of the animals while participating in observation, training and feeding sessions. All participants, including adult chaperone are required to complete a signed liability waiver. Your waiver must be completed at the time of registration and payment is required at the time of registration as well. Can my family or friends watch me participate in this program? To ensure the safety of all involved, only the registered program participants will be allowed in off-exhibit areas where the program is taking place. You may meet friends or family in the zoo after your program. These encounters will be taking place indoors and outdoors, rain or shine. It is suggested that you dress in layers and work appropriate clothing. You are welcome to wear long pants or shorts. Please wear comfortable closed toed shoes; sandals are not permitted for your safety. All attire may get wet and dirty as you participate in your encounter. Will there be a place to store my personal items? Yes, we will provide you with a secure place to keep your personal items while you participate in your zookeeper encounter program. Can I take pictures during the program? Your main focus will be on the animals and keeper you are working with but we want you to have a memorable keepsake. Cameras are permitted but should only be used at keeper discretion. Potter Park Zoo is a tobacco free zoo. For the safety of the animals, guests and zoo staff, tobacco products may not be used during the program. If you are or know that you will be more than 15 minutes late, please call 517-230-3790 and the keeper will meet you as soon as they are able. If you arrive late, the length of the program cannot be extended. Cell phones are permitted. As we know many use them as their camera. Phone calls, texting and social media must wait until your encounter is complete. Upon registration you will be provided with an informational packet that will include meeting places and parking. Any cancellations must be received seven or more calendar days in advance of the scheduled program in order to receive a refund. Registration does include a $25 non-refundable deposit. Any cancellations received six calendar days or less are not eligible for a refund. Exceptions to the refund policy will be made on a case by case basis and at the sole discretion of Sarah Pechtel, General Curator. Please follow the cancellation process outlined above. Once you have completed your cancellation, you are welcome to register for any available zookeeper encounter program. Due to limited availability, we cannot guarantee program availability. I have read through the waiver and I have questions about whether this is the right program for my child. What do I do? Please call 517-342-2703 prior to registering for the program. We will do our best to answer each of your questions and to help you find a program that is a good fit for you. Please be aware that though it is rare, any zookeeper encounter can be cancelled by Potter Park Zoo at any time due to animal welfare, dangerous weather or staff needs. If your program is cancelled, you will be contacted with as much notice as possible to schedule another date for your adventure.